Light up your home with the sun's natural and full spectrum daylighting. Eliminate unnecessary utility expense by using the sun's power to heat your domestic hot water. Let us show you all of the ways that you can add beauty and functionality to your home while you bring it into the 21st century. Be "green" and be more comfortable in your own space, whether it is your home, office or business. 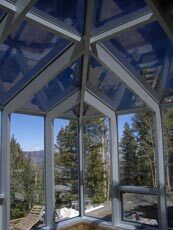 Custom Skylights to fit any design..."if you can frame it, we can glaze it!" Design Skylights and Solar Hot Water is a certified Velux Five Star skylight dealer and installer established in Evergreen in 1989. We have installed thousands of skylights in that time. Estimates are free, all materials and labor are fully warranteed.